The first really lovely sunny weather of the trip, but still cool (which I will later realise is much preferable to heat and sun). I've been having problems with my brakes, which I have to get sorted before the mountains, if I want to avoid any mishaps. My French stretched to having a discussion with a man in a bike shop about what was wrong with them - which isn't bad considering they are hydraulic disk brakes. He eventually sorts them out, although it means not getting started until 11.30. 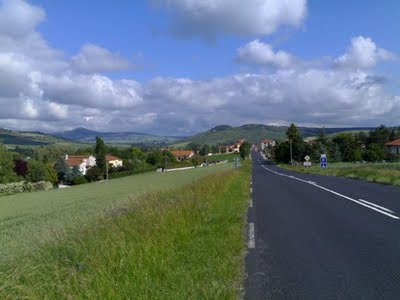 The afternoon is tougher as the hills start on the way to Clermont Ferrand in the Auvergne. But it's going really well all the same. Sadly, with about 20 miles to go, I take a wrong turn and I'm then sent in completely the wrong direction by someone, which means I drop down several hundred meters to the valley floor only to have to climb all the way back up again. When I finally do find my way, after a 10-mile detour, I'm absolutely knackered and I seem to have strained a muscle in my left leg, making it painful to put any pressure on. Still I limp into the house I'm staying tonight at St Germain Lembron. I'm staying in a gorgeous house with an anglophile woman and her family. I usually like to go out alone on these trips, but they insist I have dinner with them and they cook me a local one-pot special, with lamb cooked with vegetables - you get the broth as a soup to start. 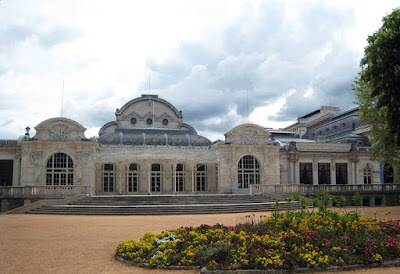 We chat away about the differences between our countries, which makes me realise how much my French has improved during the trip - it was worth doing months of lessons before I set off. I've noticed along the way that, outside of Calais and Paris, very few people speak English.